Collecting classic stories from Marvel magazines like Savage Sword of Conan and Kull (Even Tomb of Dracula as the two characters meet in these pages.) with script adaptations by Roy Thomas among others and featuring art from such 70's superstars as Bernie Wrightson, Neal Adams Howard Chaykin and even some early Mike Zeck. 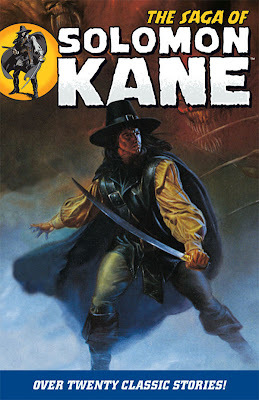 Solomon Kane was one of the many pulp creations of Robert A. Howard that were stacked in comic and magazine form under bongs and Black Sabbath albums in bedrooms all over the world. The Dour puritan with the flashing blade and a fierce hatred of evil never became as popular or well known as Conan or even Red Sonja, but he had a long career of backup feature status. Dark Horse has added him to their Robert A. Howard publishing line and this release is a nice affordable collection in the popular black and white 'phone book' format. Over 400 pages of content for under $20. Popular writer James Robinson returns to comics after a long hiatus and is joined by the beautiful painted art of Mauro Cascioli. Classic characters Green Lantern, Green Arrow and The Atom are joined by Super Girl, the new Captain Marvel and minor oddities Congo Bill and the 70's Starman in a story about the heroes deciding to become proactive and start actively hunting super villains. So far its all buildup, albeit with Robinson's sophisticated dialogue and Cascioli's expressive art. The best scene in this issue is Green Arrow twitting Green Lantern about what a man-whore he is, most of this issue is conversations on rooftops or in warehouses. Worth picking up but you may want to wait for the inevitable trade or hardcover collection. DC Comics takes another stab at reinventing the Archie Comics Red Circle heroes. Last time it was the Impact Line in the early 90's. Respectable but not spectacular and ultimately short lived. This time they've given the characters to Babylon 5 creator J. Michael Stracynski and he's begun the process of incorporating them into the main DC continuity. There will be one-shots for the major Red Circle titles The Shield, The Inferno and The Web (But not The Fly this time unfortunately.) as Stracynski does much the same for the Archie golden age characters as he did with Timely's lesser know Golden age characters in his Marvel miniseries The Twelve. 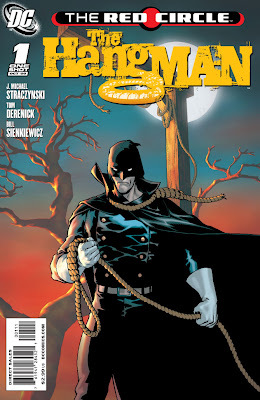 The Hangman is a well written tale of supernatural revenge, even though it does follow a rather well worn path most recently trod by DCs updated revival of western vigilante El Diablo. We've seen this all before, but its an entertaining story nonetheless. 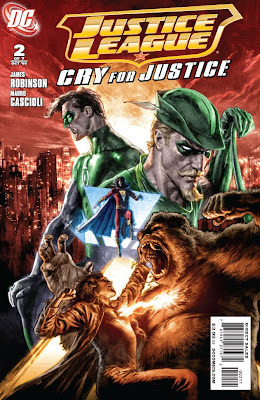 Also out his week: North 40 #2, Wednesday Comics #5, Warlord #5 and Astro City the Dark Age Book 3 #4.